Summer break is only a month away. I've been trying to think of some ways I can add structure to the summer so we won't go crazy. I wanted to create a visual display of the things my boys need to do each day. I've seen a lot of great chore charts, but I also wanted a way to regulate their screen time (TV and iPhone, etc.). Here's what I came up with. I got out some magnets I already had and some circular stickers I had as well. They happened to be the same size. Score. Then I applied a generous layer of Aleene's paper glaze. I think this product is so cool. I've been dying to try it out. I creates a glass-looking layer over things. My boys thought the "bubble magnets" were so cool. I added vinyl, but you could easily use paper and glue the words on or write on it with a marker. If you're interested in the details of the chart, here's how it goes. So, obviously they get to move the magnet to the "done" area once they've completed the task. Once it's in the "done" area the magnet equals 10 minutes of screen time. This way they can't watch TV or play on the phone until they've completed some of their tasks AND it regulates their screen time. They get one hour max a day because there are only 6 tasks. Once they use the ten minutes of screen time the magnet goes over to the "screen time" area to show that it's been used. 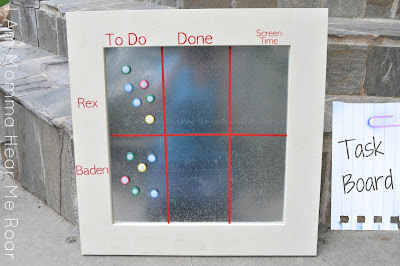 So right now the chart show that Rex has completed three of his tasks and has used 10 minutes of this screen time. The boys are pretty excited about it. I love finding ways to visually teach them principles. Visual learning always helps me understand things better and I hope it will help them as well. And here are the magnets dry.